Since 2003, the Rogers Family Foundation has been committed to improving educational opportunity and achievement for all Oakland students. While we know significant challenges remain in creating high-quality public schools for every student, our focus and commitment have not wavered. 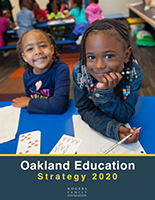 To support our vision for Oakland education, our strategy intentionally continues to focus on the three key initiatives—Quality Schools, Blended Personalized Learning, and Early Literacy—that framed the big, bold, and audacious goals we set forth in our previous strategic plan. We have seen progress in each area but know much more must still be done to close the achievement gap in Oakland, provide opportunities for all students to attend high-quality schools, and ensure all third-graders read on grade level. We are on the right track and the “pockets of greatness” that exist in our local public education system demonstrate what is possible and demand that we hold ourselves, our partners, our schools, and our city to the highest expectations in our mutual pursuit of excellence and achievement for all students. In 2018 as we approached the midpoint of our strategy, we took time to reflect on our work to date and fine-tune our approach for the next two years as we strive to meet the goals laid out in our Oakland Education Strategy 2020. As a result, we released updates for each of our strategy areas: Quality Schools, Blended Personalized Learning, and Early Literacy. These updates reflect our most current thinking and will guide how we invest in both grantmaking and staff resources through 2020. Every Oakland student will have the opportunity to learn and thrive in a high-quality school with great leaders, effective and inspired teachers, and a strong system of community supports. 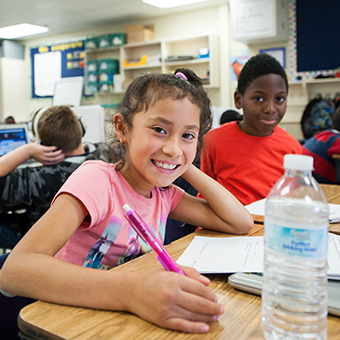 Guided by our Oakland Education Strategy 2020, the Rogers Family Foundation strives to support the creation of quality schools, expand blended personalized learning, and improve early literacy. Quality Schools. We seek to facilitate the conditions, partnerships, and direct school investments that will result in high-quality schools with the collective capacity to serve 10,000 students by 2020. Our tactics include making direct investments in schools to improve academic and school climate and culture outcomes as well as enabling the conditions to support increased quality through a focus on ecosystem readiness and development, organizing and advocacy for school quality, and collaborative spaces to create and support quality. We will also be incisive with our limited resources in identifying opportunities to advance the system infrastructure and increase accessibility to research and data to drive student outcomes and facilitate transparency for families and the broader community. 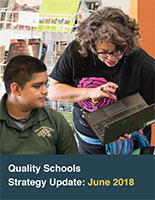 Learn more about Quality Schools. Blended Personalized Learning. We will engage school leaders, teachers, parents, students, and community stakeholders to create 3,000 out-of-this-world, high-quality, personalized, student-centered school seats by 2020. In many ways, the Next Generation Learning Challenge in Oakland is our own school innovation lab. Our tactics may include but are not limited to protecting the investment of our new school design launch through aligned partnerships nationally, regionally, and locally. Learn more about Blended Personalized Learning. Early Literacy. The north star that guides our literacy work remains the same: we want Oakland to dramatically increase third-grade reading proficiency to 85% among all students by 2020. Through our work, we have learned that it takes a whole town to move this goal. Today, the City of Oakland, Oakland Unified School District, and community partners have prioritized this same goal in their strategies. Our own efforts to reach this goal moving forward will concentrate on efforts to improve the literacy of a minimum of 2,500 (~15%) K-3 public school students through collaboration, evidenced-based interventions, and a system of community supports. We believe these are the right strategies to pursue and intend to align our funding, staffing, and organizational structures to best and most urgently get us to our goal. Learn more about Early Literacy. 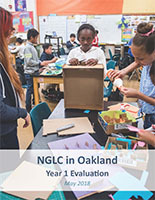 The NGLC in Oakland Year 1 Evaluation highlights grantee school’s collective progress after one year of implementation, as well as provides an overview of the status, outcomes, and challenges for each school. 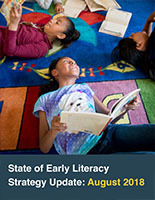 This update aims to refine our Early Literacy strategy based on learnings to date and in light of changes across the Oakland eduction landscape. The Rogers Family Foundation Oakland Education Strategy 2020 defines the current focus of our work. The plan provides details on our three key initiatives - Quality Schools, Blended Personalized Learning, and Early Literacy - and the goals we seek to achieve by 2020.